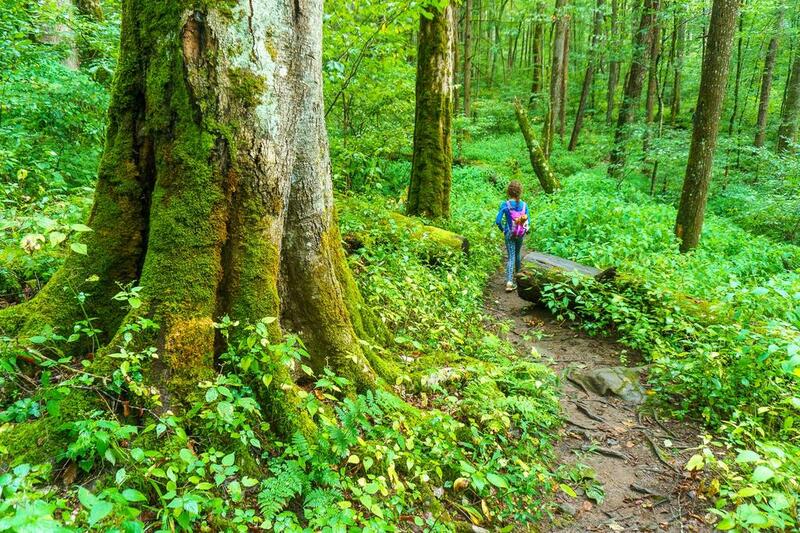 One of the most popular areas for hiking within the Cheoah Ranger District, Joyce Kilmer Memorial Forest is also one of the premier hiking destinations in all of south-western NC. A big, curved tree along the Joyce Kilmer Memorial Loop trail. This area contains an impressive remnant of virgin forest, representative of the vast Eastern forests that used to stretch from the Atlantic to the Mississippi and beyond. Exceptionally large trees of more than 100 species grow in the rich cove environment, protecting the headwaters of the rushing stream as it heads toward the blue-green depths of Santeetlah Lake. While a verdant carpet of mosses, ferns, and wildflowers rise from the forest floor and logs of fallen giants past, the largest living trees rise to heights of well over 100 ft with circumferences of up to 20 ft. Some of them are estimated to be over 400 years old. 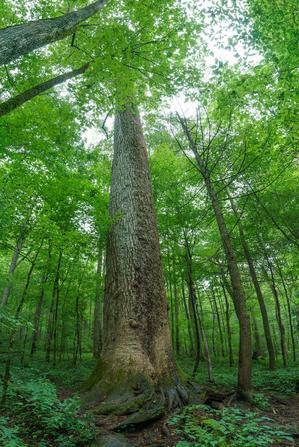 It remains a cherished and unique piece of Old Growth forest among the Southern Appalachian mountains. While much of the forest around Western North Carolina was once logged and has since recovered or remains under active management, this area was spared the logger's axe. (Or chainsaw, as it were). 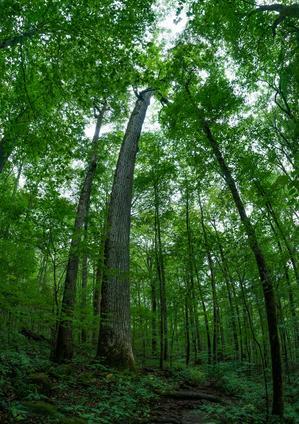 It is one of the largest contiguous tracts of old growth forests in the Eastern US. 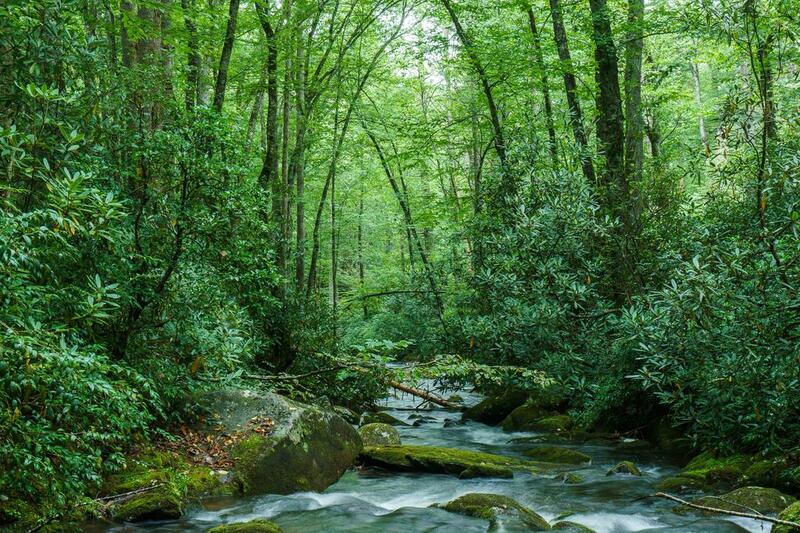 The Little Santeetlah Creek basin, which now contains Joyce Kilmer Memorial Forest, was being eyed by timber companies as they ate up the forest resources in all the surrounding valleys by the early 1930's. A rail line built along the Little Tennessee river was used to extract the high quality timber. Some say a mysterious force kept the lumbermen from destroying the forest around Little Santeetlah Creek. 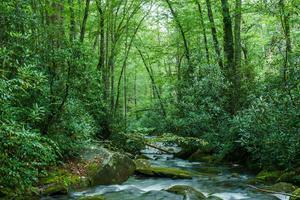 Greenery on Little Santeetlah Creek near the Joyce Kilmer Memorial Loop parking area. It might've been that the exceptionally large, healthy trees filled the lumbermen with awe. Or a variety of practical reasons, such as the flooding of the rail lines by Santeetlah Lake, may have contributed to the saving of the forest. But ultimately, a large tract of forest on Little Santeetlah Creek was left alone, despite being owned by several different parties interested in reaping the monetary value of the timber. In 1935, the Forest Service bought 3800 acres at $28 each and designated the forest to a fallen World War I veteran - Joyce Kilmer (1886 - 1918) - whose poem "Trees" was well-known at the time. In 1975, the The Memorial Forest became a part of the larger Joyce Kilmer-Slickrock wilderness, which covers over 17,000 acres of land in the area. Today, the basin is permanently protected as the Joyce Kilmer - Slickrock Wilderness and the area within the Little Santeetlah Creek basin is still given the Joyce Kilmer Memorial Forest designation. Most hikers stay on the Joyce Kilmer Memorial Trail. This 2 mile figure-eight loop trail begins at the main parking area and climbs into Poplar Cove, where some tremendous poplars still grow today. The loops, connected in the middle, can be hiked in either direction. In the middle of the figure "8", where the two loops join together, is a stone monument, with a plaque engraved with a short biography of Joyce Kilmer himself. The upper portion of the loop passes through the largest of the trees on somewhat drier ground. 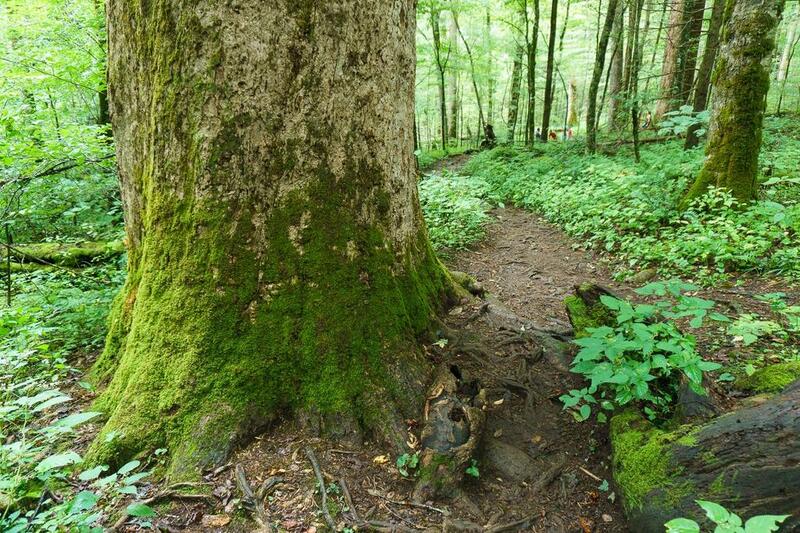 (See the Joyce Kilmer Memorial Trail's dedicated page for all the details). Aside from the memorial trail, other trails do lead deeper into the heart of the wilderness, which extends far north and west of the memorial trail to the Tennessee state line, where it adjoins with the Citco Creek Wilderness in the Cherokee National Forest. Adjoining trails include Naked Ground, Stratton Bald, and Jenkins Meadow. The Joyce Klmer Memorial Loop trail passes right over the roots of this big tree. The Joyce Kilmer parking area includes a few tables for picnicking, a restroom, and maps at the trailhead. There is no running water, so be sure to bring some for the hike. Parking is limited, so be sure to arrive early on those popular summer weekends to ensure you can get a spot. Located just a short distance from Joyce Kilmer and Santeetlah Lake, Horse Cove Campground has 18 campsites located beside a rushing mountain stream, Little Santeetlah Creek. Drinking water and vault toilets are available in the campground. A few sites remain open year-round, although no water is available in the winter. Sites are available only on a first-come basis. Rattler Ford Group Campground, just a short distance from Joyce Kilmer (1/4 mi) and Santeetlah Lake (2.5 mi), offers a group camping area adjacent to the swift-moving Santeetlah Creek. Large trees and thick forests provide moderate shade for the campground, while vast meadows also allow for sunshine and open play. Horseshoe pits and volleyball courts are available within the campground, which can accommodate groups of up to 25 guests. Flush toilets and drinking water are provided at the campground, as well as hot showers. Some of the sites are situated near the water. From Robbinsville, NC, there are signs directing you to the forest. Follow US Hwy. 129 North for 1.5 miles to NC 143 West (Massey Branch Road). Turn left and go 5.0 miles to a stop sign. Turn right onto Kilmer Road. Follow this road for 7.3 miles to Santeetlah Gap and the junction with the Cherohala Skyway straight ahead. Turn right; continue for another 2.5 miles. Turn left on the access road for Joyce Kilmer Memorial Forest; it is about 1/2 mile to the parking area.